It’s a good season for Helen. Not only does she continue her reign at New York’s theatre awards for her performance in “The Audience”, The World Jewish Congress has also honored her with the WJC Recognition Award for her role in “Woman in Gold” and for helping to educate the public about the issues of Nazi-looted art. A ceremony date has not been announced, but pictures from yesterday’s Drama Desk Awards and Stephen Daldry’s 2015 Tony Nomination Celebration have been added to the photo gallery. 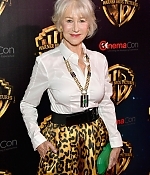 Yesterday, Helen Mirren was a guest at the 81st Annual Drama League Awards ceremony and luncheon. Pictures have been added to the photo gallery. 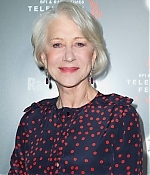 Helen Mirren continues her busy schedule with additional appearances at the New York Theatre Workshop’s 2015 Spring Gala and the unveiling of her caricature for Sarids. Also, Theater Talk has aired a lenghty interview on “The Audience”. A video clip of this will be added later. For now, screencaptures have been added to the photo gallery. Helen continues to hit the New York scene these past days with appearances at the Metropolitan Museum of Art Costume Institute Benefit as well as the Drama Desk Awards Nominees reception. Pictures from both events have been added to the photo gallery, with additions from the Tony Nominees reception uploaded as well. My biggest thanks to Claudia and Lindsey for always making sure I’m up-to-date 🙂 Thank you very much! Enjoy the new pictures.